Young people with placards reading 'Without a house, without a job, without pension' during protests in April. 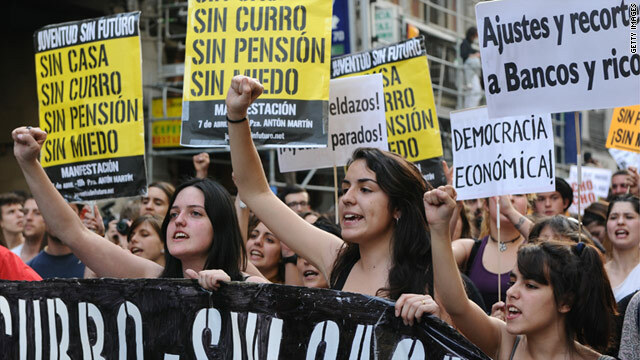 Madrid, Spain (CNN) -- Spain's unemployment rate rose nearly a point to 21.29%, with 4.9 million jobless for the first quarter of 2011, the government reported Friday, as the prolonged economic crisis continues to squeeze the nation. Some analysts had predicted the number of jobless might surpass 5 million. But while that didn't happen, the latest statistics were another blow to the economy and to the embattled socialist government. The numbers for the fourth quarter of 2010 -- 20.33% unemployment and almost 4.7 million jobless --- already represented the highest joblessness rate in 13 years. The latest numbers, for the first quarter of this year, added more somber news. The number of unemployed increased by 213,000, pushing the overall number to 4.9 million. All major sectors --- industry, construction, services and agriculture --- shed jobs during the quarter. The number of Spanish households in which no adult had a job increased by 58,000, to a new total of 1.38 million, the government said. Earlier this month, embattled Socialist Prime Minister Jose Luis Rodriguez Zapatero announced he would not seek a third term. Elections are due by March 2012. For months, Zapatero's Socialists have trailed in opinion polls behind the main opposition conservative Popular Party. In announcing his decision on April 2 to Socialist Party leaders, Zapatero said, "We have made mistakes." He added that "recent months have been very difficult for the work of the government" because even after enacting a budget austerity plan to reduce the public deficit that put Spain under pressure from international financial markets, the destruction of jobs continued. Local elections in all Spanish cities and for 13 of its 17 regional parliaments will be held May 22. They are widely seen as a bellwether of voter sentiment for the general elections to follow.